If I were to be asked what my "style" is I would have to say it is rustic or primitive. I'm drawn to handmade items and country charm and simplicity. 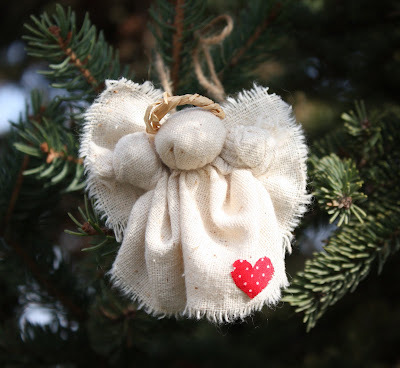 In my effort to create handmade ornaments for our Christmas tree this year I made these little rustic Christmas angels while watching tv last night. These go together in just a few minutes with a simple supplies. I think these angels will look very sweet hanging on the Christmas tree as well as made into a lapel pin to wear on my sweater or jacket. Step 1. For the head and body, fold one long edge of the 4 1/2" X 7 " muslin down 1 1/2" and place the fiberfill ball between the layers of muslin at the center of the fold. Using a doubled thread tie tightly under the fiberfill to form the head and pull up the head. Step 2. Now you have a head and need some arms. The arms are merely knots. Pull up and tie one corner and knot close to the head. Repeat for the other arm. Step 3: Cut out a small heart and glue it or rough stitch it to the angel. Step 5: For the wings, take the remaining 2 1/4" X 3 " piece of muslin and make tiny fanfolds from the long edge to long edge. Tie tightly in the center with a doubled piece of thread. 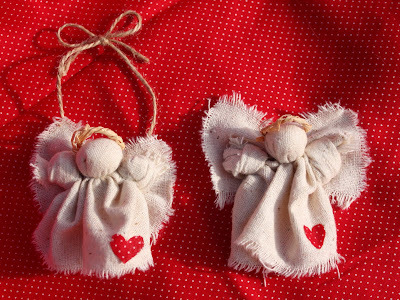 Sew or glue the wings in place on the back of your angel. 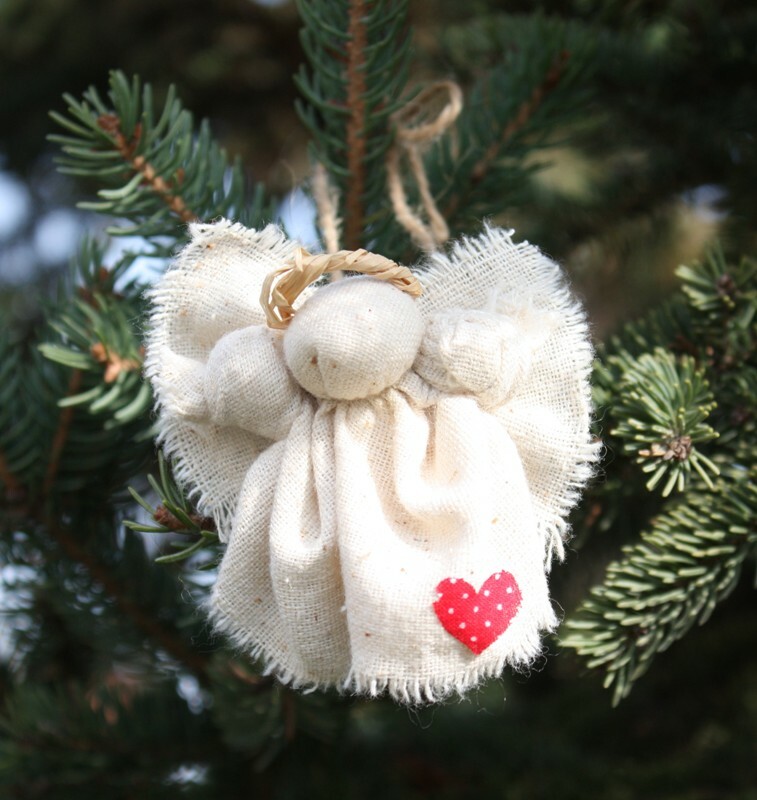 Step 6: To make your angel an ornament, tie a piece of ribbon or jute (I used jute to keep with the rustic look) to the angel's back. If you prefer to wear your angel as a pin, glue or sew a jewelry pinback to the back of your angel. Feel free to use and share my little angels. I hope if you make these angels you'll link back here let me know and show me yours. I am going to make up a few more for little gifts. I have some more ornaments I'm making that I'll show you soon. Oh deary me.... she's adorable!!! 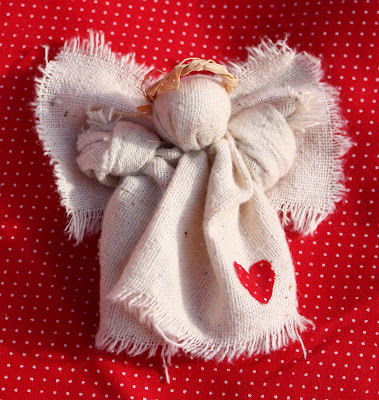 Hi Jennifer, would you allow us to use your *adorable* angel pattern for a Fair Trade project? This would be a great way to use all our leftover fabric, and the proceeds would go towards a bonus for the ladies working in the project. Do take a look at www.handmadeincr.com. All the best!